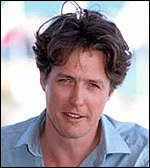 Two tedious things everyone knows about Hugh Grant : he is "floppy-haired" and he was arrested in Los Angeles in 1995 for engaging in "a lewd act". These scraps of information to one side, he is arguably the most persuasive romantic comedy lead in several decades. He had been trundling along unexceptionally for some years, having made his first film Privileged (d. Michael Hoffman, 1982) while he was still at Oxford. He had done well enough in Merchant-Ivory 's Maurice (1987), had fun as Chopin in the camp biopic, Impromptu (d. James Lapine, 1991) and been affable as Lord Darlington's reporter nephew in Remains of the Day (d. James Ivory, 1993). Then everything changed when he starred as the diffident hero of Four Weddings and a Funeral (d. Mike Newell, 1994), bumbling priapically to the inevitable final embrace, and revealing a technique and timing which led to comparisons with that other Grant, Cary . In 1995 releases, he honed this persona in The Englishman Who Went Up a Hill... (d. Christopher Monger) as the eponym educated by Celtic canniness, brought agreeable life to Jane Austen 's wettest hero in the deft version of Sense and Sensibility (UK/US, d. Ang Lee), and even in the execrable US comedy, Nine Months (d. Chris Columbus), though perhaps his best performance was as the affected theatre company boss in An Awfully Big Adventure (d. Mike Newell, 1995). It took four years to reinstate himself in the censorious eyes of the ticket-buying public after his arrest, but he finally did so with Notting Hill (UK/US, d. Roger Michell, 1999), a charming feel-good romance in which Julia Roberts this time persuades him to take the emotional plunge. His timing, his way of testing and savouring dialogue, particularly Richard Curtis 's (in his two major hits), and his obvious good looks, have made him in demand internationally, as in the New York comedies, Mickey Blue Eyes (US, d. Kelly Makin, 1999) and Small Time Crooks (US, d. Woody Allen, 2000), and he nabbed a key romantic comedy lead as sleazy Daniel in Bridget Jones's Diary (UK/France/US, d. Sharon Maguire, 2001). He lived with actress-model Elizabeth Hurley for 13 years, until 2000, forming their own company, Simian Films , which produced the thriller, Extreme Measures (UK/US, d. Michael Apted, 1996). Biography: Hugh Grant by Jody Tresidder (1996).